I have hankered after visiting Japan all my life. 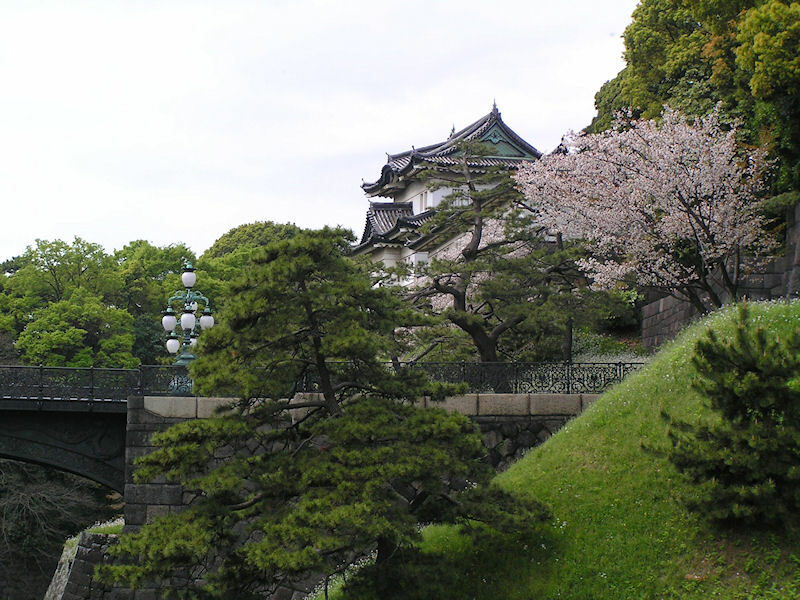 When I saw an advertisement for a tour of Japan by Bullet Train I was immediately hooked; so in April 2008 we spent a couple of weeks sampling its delights. The country is truly an enigma, a mix of contrasts and contradictions: traditional rural communities alongside some of the biggest hi-tech cities in the world, both cultured and brash, understated and flamboyant, busy yet clinically clean, crowded but everyone is courteous to a fault. We flew into Osaka to experience a masterpiece of Japanese ingenuity, the amazing Kansai Airport. Built on a man-made island in Osaka Bay it is a marvel of civil engineering and Japanese technology, so vast that you need a train to travel from the arrival gate to immigration and customs. First impressions are of cleanliness and efficiency, but soon you are waiting in the usual half-hour queue for the entry formalities. We were met by our delightful Japanese guide Kasuo-san who accompanied us throughout the tour. His English was immaculate, colloquial and sometimes very amusing; he also had a very good singing voice, which we enjoyed on several occasions. Clearly he had been guiding for a very long time. Then we were on our way to the former capital city of Kyoto, just over an hour away by coach, for a first glimpse of this extraordinary country: a mainly mountainous terrain littered with a cluttered urban landscape, cherry blossom absolutely everywhere (lucky us! ), most signs in English as well as Japanese, and a fifty mph motorway speed limit! Jet lagged by a twelve hour flight and an eight hour time change, we sought refuge in to our enormous hotel in the heart of the modern city. The ancient city of Kyoto is a classic metaphor for Japan, a startling mix of the old and the new. From our hotel we could see the gleaming station complex literally teeming with Shinkansen bullet trains, and the skyscrapers of the modern city dominated by the four hundred foot tall Kyoto Tower. But the next morning, just a short coach ride away, we found the Kinkakuji Temple, a magnificently restored Shogun retirement villa dating back to 1397, and had a taste of the city's history. 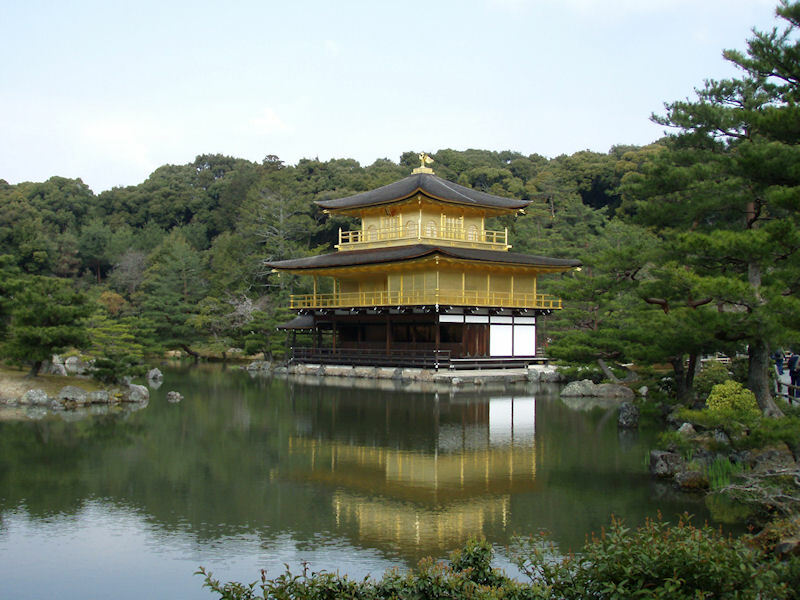 Decorated in gold leaf, the 'Golden Pavilion' stands on a lake in beautifully groomed gardens, and was truly Japan as I had always imagined it. Then on to Nijo Castle, a more familiar tourist destination but nevertheless a delightful introduction to some of the icons of this ancient culture: Tatami mats, with attendant rules about their size and construction; removing one's shoes before entering a building (not surprising given the price of the mats! ); gestures of respect (the ubiquitous bowing); and the fundamentals of Buddhism and its Shinto variant. This was not the turgid experience it might sound, but rather a fascinating insight for us into an unknown culture. However, our afternoon visit to a traditional Japanese tea house was the archetypal tourist experience bearing little resemblance, I suspect, to the genuine ancient ritual. The city of Nara, some fifty miles to the south of Kyoto, is another former capital of Japan from 710 to 784 and a feast of traditional Japanese architecture, shrines and temples. 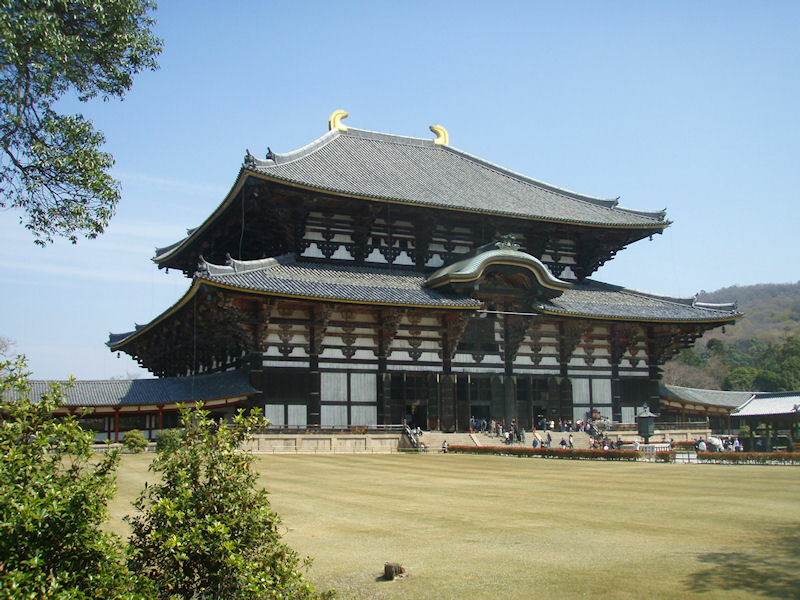 We took the Kintetsu Express, punctual to the minute, to Nara and began our tour at the Todaiji Temple, reputedly the largest wooden building in the world. In the sunshine and framed by countless cherry trees in full blossom, it was breathtaking. Like much of our tour we spent most of the day on foot, which was clearly the best way to enjoy the many sights, sounds and smells of our itinerary, but rather hard on little used muscles. The walk through the deer park to the Kasuga Shrine was delightful and surprisingly hot, but worth the long climb. As well as being a Shinto shrine it is also a spectacular collection of religious artefacts which seem to define the Buddhist religion: lanterns, flags, prayer wheels, bells and gongs in colourful juxtaposition. We learned how to offer a prayer with ritual gestures, claps and bows, and to pay our respects to the departed. The whole thing was conducted in a respectful and courteous manner, and we were once again in awe of the politeness of our hosts. Even the children were quiet and attentive, in sharp contrast to the behaviour we frequently endure back home. A young family had brought their new born child to the shrine, apparently for some religious introduction to the faith, and we watched in respectful silence as the ritual unfolded. On our second evening in Kyoto we visited the old town to see the Geisha district, and dined at a tiny local restaurant; four of us with no Japanese! With much hand waving and the indulgence of the ever-courteous locals, we managed a three course meal with beer and coffee, and even a taxi home, feeling very adventurous and pleased with ourselves. The meal cost us around eight pounds per person, and the taxi back to the hotel six pounds, the latter a little less than the four underground fares we had paid on the way out. Our expectation of high prices in Japan was completely false; eating out was cheaper than at home and everything we bought, from postcards and cups of coffee to souvenirs, was good value by UK standards. Tokyo clothing boutiques were the only notable exception! 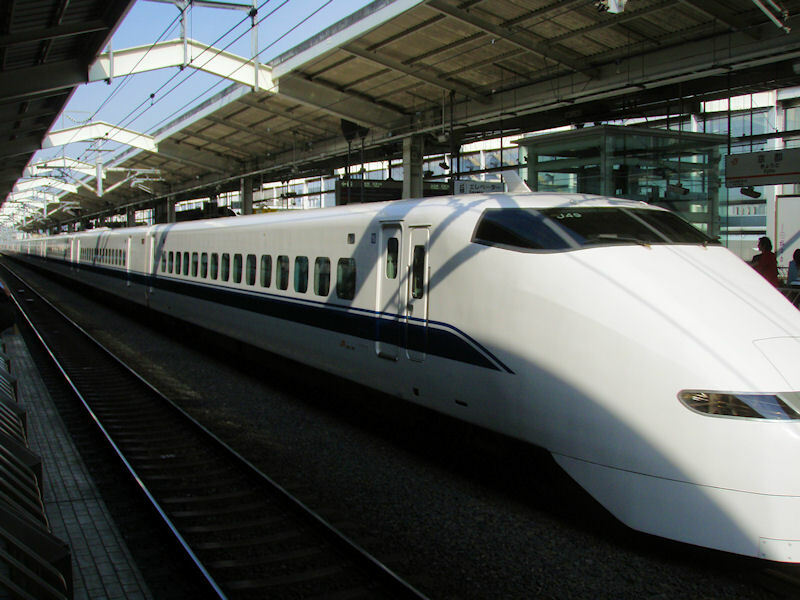 Next came the experience I had most anticipated, a ride on a bullet train or Shinkansen (literally - new fast line). I was not disappointed. These electric trains comprise sixteen carriages with airline style seats and spotless washrooms, buffet and hostess service. They run to the minute, with the guard watching the second hand on his watch before signalling a departure. Platforms have a guard rail with gaps for the automatic doors, and the train stops at precisely the right place for boarding and disembarkation. There are electronic colour display screens on every platform and at both ends of each carriage detailing all the journey information you might need to know - in both Japanese and English. I had my GPS navigator with me and I can confirm that their top speed is in fact 188 mph, or 300 kph as advertised. They were as smooth as silk. We were whisked west from Kyoto to Hiroshima in well under two hours, including three scheduled stops and an excellent cup of coffee.  Not for the last time did I ponder the unfavourable comparison with our own indifferent services back home. Unsurprisingly Hiroshima is defined by the dubious privilege of being annihilated by the first atomic bomb in 1945. Its most famous building is the Peace Memorial Dome, its prime tourist attraction the Atom Bomb Museum, its main avenue the track of the 'Enola Gay', and every second street sign seems to feature the words 'atomic bomb'. Nothing is older than sixty-three years so the city has no old quarter or architectural heritage, and even the layout was changed when it was rebuilt. The city has adopted the mantle of peace, and references to their peace initiatives around the world abound. However, I found it hard to ignore the reason why they had become victims and to accept their victim culture. While we were in Hiroshima one of our holiday friends had a birthday, and we decided to try and buy a birthday card for her. We found an information desk in a large fifteen story department store, and in perfect English we were directed to the fifth floor. The card section was enormous, so we found a nice one with an undecipherable greeting and enquired of a helpful assistant what it meant. 'Happy wedding' she replied with a big smile and a characteristic bow, and on hearing me say 'birthday' she lead us to the appropriate shelves. Another example of Japanese service. 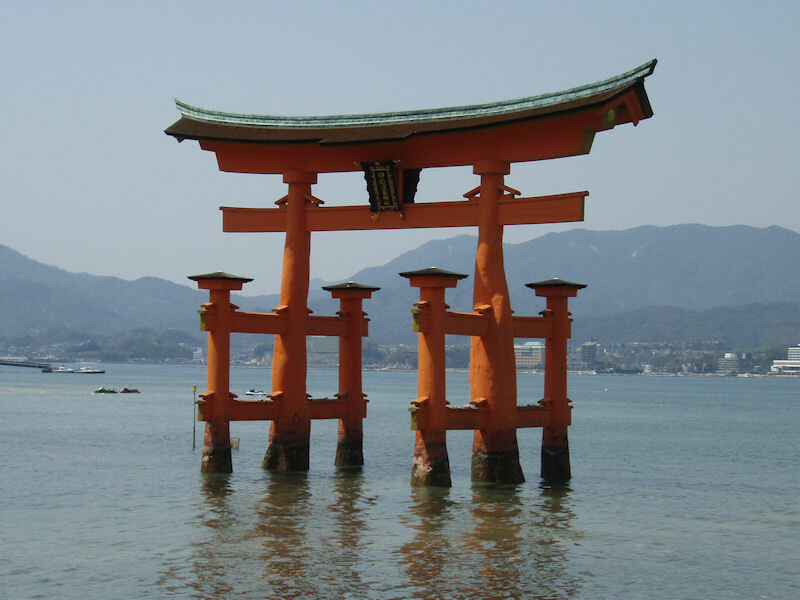 We left Hiroshima by public tram, all thirty-six of us, and trundled through the suburbs for forty minutes to the dockside, where we boarded a ferry to the island of Miyajima. This picturesque holy island is a truly beautiful spot, site of the Itsukushima Shrine, offering wonderful views from the top of its 1600 foot peak reached by cable car. We stayed at a Ryokan hotel where we enjoyed a traditional dinner and overnight stay Japanese style. This involved wearing a kimono and socks throughout our stay! Our room was large but almost devoid of furniture, save for Tatami mats, a low table and two chairs. However, our anteroom did have a fridge and hot drinks making facilities, and there was a state-of-the-art flat screen TV with two English language channels, a bathroom with shower and hot tub, and a modern loo with heated seat. But no beds, just two futons on the floor; very hard and difficult to get out of! Dinner was an elaborate ritual involving many strange and unrecognisable dishes; some you were obliged to cook for yourself on a small table top stove. Chopsticks were the order of the day, which we grappled with manfully. I confess to struggling with the food, especially the raw fish and odd flavoured vegetables. We were instructed in the etiquette of dining, including how to congratulate the chef, which involved a lot of clapping and bowing. What impressed me was that everyone on our tour dined in a kimono, perhaps because we had a private room and nobody was brave enough to buck the system. It was a cultural experience we shall never forget! Breakfast, thankfully, was more western style but nevertheless a challenge to my palette. In the morning we gratefully retrieved our footwear from the lockers in reception, bowed to everybody in sight and retreated to the ferry. As we retraced our journey back to Hiroshima station the heavens opened and it continued to rain all day, one of only two wet days on our trip. Our group was undaunted as we spent almost the entire day travelling by train, first east to Nagoya by Shinkansen and then north through the 'Japanese Alps' by scenic railway to the mountain town of Takayama. Because of its relative isolation high up in the mountains, Takayama has preserved its historical heritage and is as close to a time capsule of traditional Japan as you will find. We spent two nights there enjoying its open air markets, municipal buildings and the narrow wooden streets of the old town. 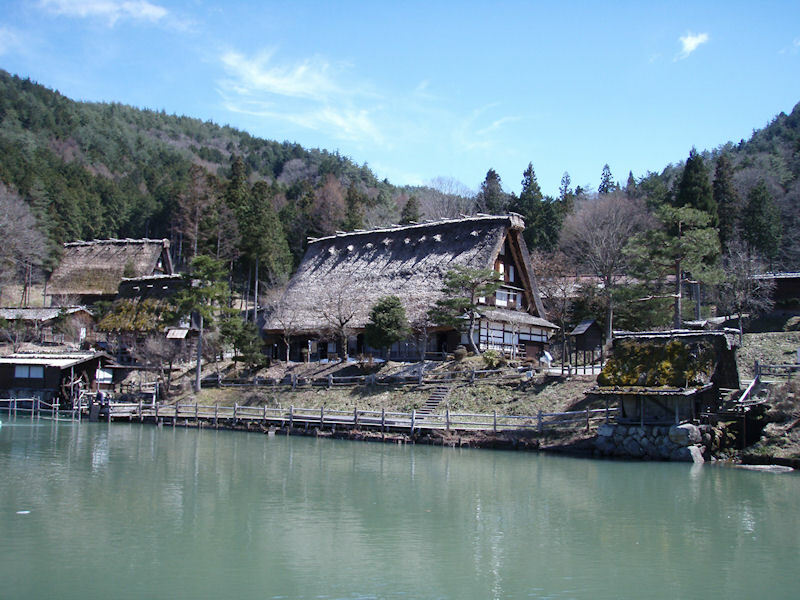 Of special interest was the Hida Folk Village, an open air museum of some thirty traditional rural buildings full of the artefacts of village life. Despite the sunshine there were snowdrifts in the car park. On our second evening we ventured into town for a dinner in a French restaurant. It accommodated twelve diners and was run by a lone man, who showed us to our table, took the order, cooked and served it. Some help finally arrived from the bar opposite, a girl who served the sweet and accepted our payment. The ultimate vertical integration! The meal was excellent and a very good price. Japanese culture is service culture. On leaving the town we retraced our journey on the scenic railway south back to Nagoya, and took our final bullet train east to Mishima en route to the Hakone National Park. Travelling at around 180 mph I glanced left out of the window and there, to my astonishment, was Mount Fuji. I grabbed my camera and snatched a single hazy photo before it disappeared, never to be seen again. Our guide Kasuo-san explained that Mount Fuji 'is shy mountain' and visible only around one day in eight. After a coach ride to the Hakone National Park we took a short cruise across Lake Ashi to Togendai, and then a cable car to see the hot springs at Owakundani where it is traditional to boil an egg, a lengthy process at this altitude. The Japanese love their gardens, but they are happy to embrace the style of cultures other than their own. 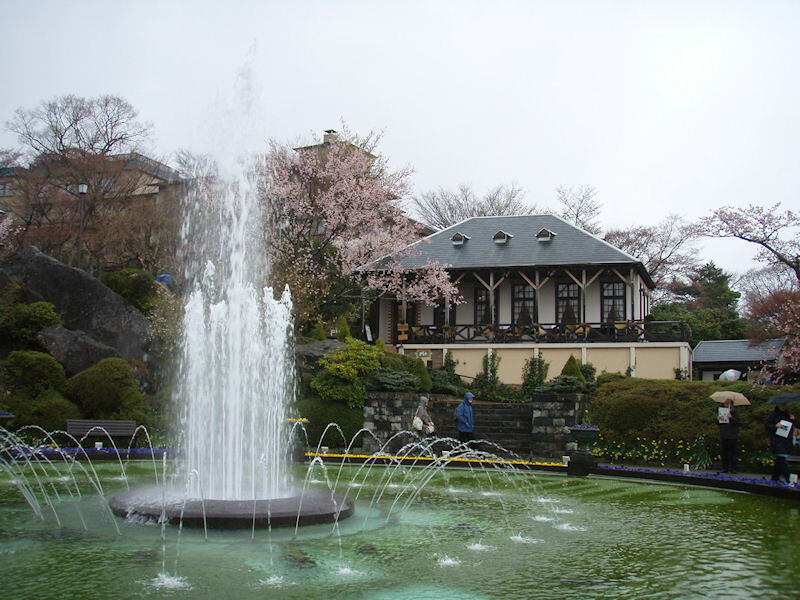 A lovely example is the French Garden at Chokokunomri, built on a hill side in a rural setting. Even on a dull April morning (our second rainy day) the garden was a riot of colour. The tea house (see photo below) cocoa was good too. There is a no-tipping culture in Japan, and leaving one can be considered rude. I fell foul of this at the French Garden tea house when I left a 1000 Yen note for a 960 Yen bill. The elderly waitress chased me out of the building in the rain and thrust 40 Yen, about 20p, into my hand with a look that said it all. I did not do it again! That afternoon we boarded the Tozan Railway for the final leg of our journey to Tokyo. We had travelled first class on all our rail journeys throughout the tour, but this time we had the special treat of riding in the glass fronted Romance Car at the front of the train, so we had a magnificent view of our approach to Japan's capital city. Tokyo is one of the world's largest cities. The population of the metropolitan area at 35 million has been the most populous urban area anywhere since 1965, and still growing, so we expected excessive crowding and cramped urban spaces. However, our experience did not confirm these fears; busy certainly but with plenty of open spaces, and even the underground at rush hour was more comfortable than London's tube. Our hotel was a massive 34 story edifice in the Shinjuku district to the west of Tokyo centre, with a vibrant shopping area and many varied eating places. After an opening tour encompassing the Asakusa Kannon Temple and the Ameyoko market we struck out on our own to see as much as we could during our three night stay. As in many large cities the best way to travel is the underground, and since Tokyo has an extensive network it is no exception. But travelling on our own in such a vast urban area with no knowledge of the language was a daunting prospect. We found a map, but it was in Japanese! We decided on where we were going, including a change, but struggled to buy a ticket from the automatic machines. As ever we had no shortage of helpers, all keen to practice their English. When we moved off for the 'Maranouchi' Line a man ran after us and pressed on us an underground map in English. Bless him! Like most things Japanese the underground system is very hi-tech. All the station names are in both Japanese and English with consecutive colour-coded numbers to help the foreigners; an illuminated moving display showing your location is in every carriage; station announcements and connecting services are also in Japanese and English. It's all a doddle really! We made it across town to the harbour and took the elevated railway (another ticket courtesy of a helpful passerby), a totally driverless train which circumnavigated the very modern refurbished docks. How can this nation be so much better at everything than us? On our final day we found the Tokyo tourist office, incredibly just a tiny room on the tenth floor of a tower block miles from our hotel, thanks to a helpful travel agent and much gesticulation. Armed with their map we found the Imperial Palace and visited the immaculate East Palace Garden. Next day we flew back to London from Tokyo's immaculate Narita Airport to the grubby shabbiness of Heathrow's Terminal 3. The comparison was stark and painful. We found Japan to be a clean and efficient country and its people a model of courtesy and consideration, with traditional values despite their hi-tech environment. We felt safe at midnight in the big cities and saw no manifestations of ugly behaviour anywhere. It is a delightful holiday destination which exceeded our expectations; but I wonder what it is really like to live there. You surely need more than two weeks to find out.